One of the most loved frozen dairy desserts, ice cream is popular not just as a dessert per se, but as the foundation of many other delectable delights. From sundaes to parfaits to ice cream cakes and baked alaskas, ice cream lends itself well to creations that range from comforting and pleasant to downright haughty. Take the Serendipity 3 in Caesar’s Palace Las Vegas. This luxurious cafe is home to many indulgent and over the top desserts, including the Grand Opulence Sundae, a $1,000 ice cream confection that’s among the most expensive desserts in the world. I know checking out Serendipity 3 is on my personal list of things to do in Vegas, when I finally get to vacation there. While I doubt I can ever afford the Grand Opulence Sundae, I can at least try their other specialties like the Frrrrozen Hot Chocolate and rich soda fountain sundaes. In the meantime, I’m sticking to my favorite ice cream-based treat, the root beer float. 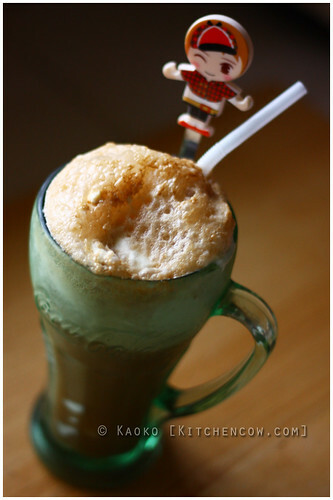 Icy, creamy, bubbly and sweet, the root beer float feels like a dessert for me, even if technically, it’s a beverage. Even the simple act of putting one together is a hypnotic, calming ceremony for me. I start off with a thick glass. Then, throw in a generous scoop of vanilla ice cream. Or two. The dense, packed kind you pull straight from the freezer. None of the fluffy, soft-serve stuff you get from ice cream machines in burger joints. Then comes the best part. I pop open a can of root beer, A&W is my personal preference, then pour oh, so slowly, watching a thick froth form and rise up, slowly struggling to form the lip of the glass even as the wild, root beer bubbles try to pull it down. It’s magical, this moment. As the familiar aroma wafts to my nose, of root beer and ice cream struggling for supremacy, I stick in a straw and take a sip. Nothing comes close to the simplicity and stark contrast offered by the marriage of these two. Simply marvelous. This entry was posted in food spotlight, how-tos, recipes. Bookmark the permalink.